Have you ever wondered how to get vaulted ceilings inside your home? Or change the look of your house from a ranch style to a cottage or bungalow style? One answer would be to change the pitch of your roof. The pitch of your roof is its slant or the steepness of its slope. The pitch of your roof is determined by the walls, ridges, and rafters inside the roof – in your attic space. Changing the pitch of your roof is more involved than simply replacing the roofing materials. In other words, it’s not a routine roof replacement. 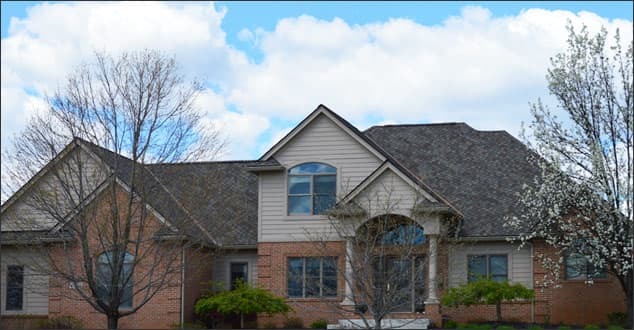 When we talk about a “new roof” we typically mean tearing off and replacing the old shingles, any damaged roof decking, flashing, and the old gutter system and replacing it. Changing the pitch of your roof would require bigger structural changes like replacing the roof’s ridges, eaves, props, rafters, and internal walls. Let’s take a look at why you would want a more serious roof replacement and structural change. Replacement of your roof’s underlying structure would need to happen if your roof has a serious rot problem or is majorly sagging. A sagging roof shows there may be problems not only with the roof’s decking but also with its foundational elements. Since the expense of changing your roof’s structure is more like the expense of adding on to your house, it’s something you might think of doing if you’re also planning an addition. If you’re adding another story or half story, you will have to replace the roof anyway and you will need to consult a structural engineer – which is often the case when changing the pitch of your roof. This could give you the opportunity to make your roof a new shape and change the overall look of your house. If you like the layout of your home and don’t wish to add another story but you would like to add vaulted ceilings or simply raise the ceilings inside your home, you might be looking at a structural change to your roof. Some of these changes could be done with your existing structure, but you won’t know until you consult an engineer and contractor. A change in the pitch of your roof will affect everything from the way your roof looks, the way it handles water, and more. It’s not a low-cost project, so be aware that you’re getting into a major renovation if you’re changing your roof’s shape. If changing the shape of your roof isn’t necessary, some builders would advise you to simply leave it as it is and search for a new home. It doesn’t just include the framing of the roof, but it could potentially impact the plumbing and electrical systems inside your home as well as the insulation and drywall costs for replacing and adding what was lost. However, for some homes, it could solve a variety of problems – like water pooling and debris trapping – and make your next roof last a lot longer. It could also create more space in the attic. Whatever reason you are thinking about changing the pitch of your roof, be sure to consult a professional home renovation team for your best options. Are you located in Southeast Michigan? Please give us a call. We would be honored to help with your roofing and renovations needs.